Ships within 3 business days. Please allow up to 1 week transit time for your item to arrive. 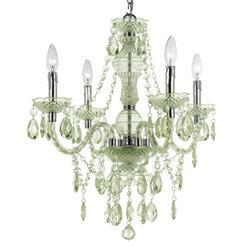 A fun, alluring piece of bohemian style, this petite, sea foam green chandelier gives high style in simple materials. Who knew plastic could look so good? Dripping in teardrops and swag, this piece delivers a delightful, strong statement.